A delightful one bedroomed ( linen provided) gite set within seven acres of lawns and woodland, Quatre Bougies is the perfect rural retreat, with guest appearances from eagles, buzzards, kites and other wildlife.. In the absence of light pollution, the night sky is a stargazer's paradise. The gite snuggles jn the countryside just outside the small hamlet of Rivel near Chalabre, about 45 minutes from Carcassonne airport. This comfortable gite has its own private patio, leading from the kitchen area - ideal for breakfast in the sun, a lazy lunch under the parasol, evening drinks and BBQs . Quatre Bougies also has access to the owners' swimming pool ( pool towels provided) and shaded, wooded areas. Smoking is allowed outside the property only. With a double bed in the bedroom and a sofa bed in the living area, this gite can sleep 3 people comfortably. Crisp, white bed linen and large, soft towels are provided. Baby equipment package available, please ask for details. Come at the right time and help yourself to the fruit from the orchard, be it golden mirabelles, ruby red mirabelles, hazelnuts, plums, figs or just have to be here in season! The property is In close proximity to the swimming lakes of Montbel and Puivert, and is within the 'Pays Cathare with the famous Montsegur Chateaux nearby. Free WiFi is available for guests, giving access to email, TV channels, facebook etc. Shops, market, cafes and restaurants are within five minutes drive, and larger shops are within fifteen minutes (Lavelanet). A highly acclaimed restaurant and bar is less than five minutes walk away. Ski resorts are within 50 minutes (some of these are open in summer for walking and mountain biking).The gite is well placed for those who like to choose different ski resorts throughout the week, or just have a quick, cheap ski weekend. White water rafting and canoeing are a short drive away. The beaches near Perpignan are just over an hour away. The area is ideal for cycling, walking and other outdoor pursuits. Rivel snuggles gently in the foothills of the Pyrenees, on the border of the Ariege and the Aude. This is deep in the heart of Cathars country, as any Kate Mosse reader will recognise the local place names. Indeed, you can follow the Pays Cathares from the grand Cite de Carcassonne, to Mirepoix, Puivert, Quillan and of course, the imposing Chateau de Montsegur. Visit the many sites that truly reflect the two key periods to have had a strong impact on the history of this part of France; The Roman times and the Middle Ages. Many castles and abbeys bear witness to a rich historic past, giving this region an outstanding heritage. With thousands of kms of marked hiking paths, this region offers a wide variety of landscapes featuring Cathar castles, caves, chateaux and the most magnificent scenery. The Tour de France often comes this way, winding its way through the highways and byways of the area, making it a cyclist's paradise, whether it be gently pedalling through the valleys or stepping it up to climb those hills, but bring your own yellow jersey! The preserved beauty of the Languedoc can be taken in on one of the many cycle routes throughout the region. The local vineyards are testament to the fabulous weather conditions in this region. Limoux is famous for its Blanquette and Cremant sparkling wines, said to be the forerunners of champagne. The local red wines are a treat to behold, ranging from a full bodied Corbieres to a more gluggable Languedoc-Rousillon. Many a vineyard offer guided tours and sampling. Rivel is well placed for a plethora of activities, indeed this sleepy hamlet comes alive in the summer months when they have their own fetes and festivals. In fact, all the surrounding villages have their own fetes, festivals and weekly night-time markets. The local village of Puivert offers a splendid swimming lake, with its myriad of café bars and amenities. it even boasts its own brewery and bar! Just 50 minutes from Carcassonne mean easy access to and from the airport or a day in the Cite. Being so near the rivers Aude and Ariege, this area has access to all river sports including fishing kayaking, canoing and white water rafting, whereas the lake at Montbel lends itself to the more sedate watersports of sailing, wind surfing and pedaloes. If you don't want to get wet, the area offers caves, Cathar sites, Romanesque art, chateaux, castles, nature parks, adventure parks, farms, curiosities, museums, markets and festivals. If you are fortunate enough to be here between January and March, then Le Carnaval de Limoux is a must. Said to be 'the longest carnival in the world', this festival of Fecos & Goudils ( hidden people) dances its way through the medieval arcades of Limoux, accompanied by music. This is pure folklore at its best. Many a market in this area will have Artisanal stalls, offering anything from bread, wine and cheese to handicrafts and clothing. If you only do one market, make it the Monday market at Mirepoix if you can. The local town of Chalabre has a magnificent chateaux where, in the summer months they hold Medieval festivals with jousting, birds of prey displays and feasting. You can make a holiday in this area as relaxing or as energetic as you all here for the taking. 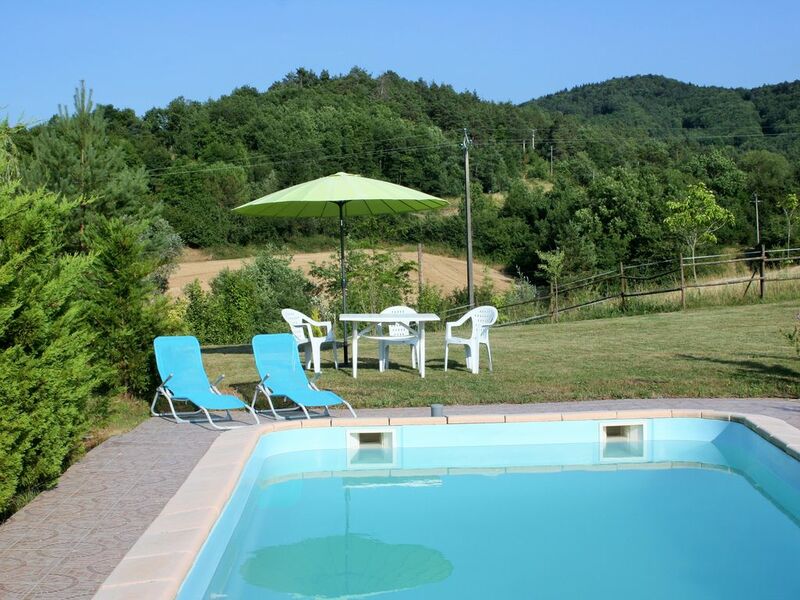 Very well equipped, cosy, comfortable and clean gite. Great location and pool. Friendly hosts. We had a great stay at this very comfortable gite and wish we had booked for longer. Gill and Lionel have thought about their guests every need when equipping this gite, including extras like washing and cleaning items that are so often not available. There was also a welcome pack which included a delicious home made loaf - thank you. The kitchen is modern and all the rooms were very clean. The bed was very comfortable and as it's a French double it is slightly larger than a British double. There was a lovely private terrace outside the front door with table and chairs, barbecue and comfy deck chairs, too. The pool was a lovely size and was just a few short steps away from the gite. The surrounding views were fabulous. Gill and Lionel were excellent hosts: friendly and good company, available for help when needed, yet always discreet. We received excellent instructions for finding the gite and its position is excellent for visiting so many places. Wifi was excellent as well and never let us down. We are happy to recommend this gite and will return when we next visit this area. We're glad that you enjoyed your stay , you certainly made the most of your time here....so much to see and do in this region...and of course, the pool at the end of a hot day. Property was very compact, clean and comfortable. Pool was lovely. Location was very private. We had a very enjoyable time. Our accommodation was fine, the pool was most inviting and the owners, Gill and Lionel were very friendly and helpful, from giving detailed instructions as to finding the property to suggesting things to do, such as visiting a night market. Although there was little in Chalabre itself the surrounding villages were appealing and we travelled round the area to sites of interest - chateaux, abbeys and, particularly, the medieval city of Carcassonne. Thank you for the kind review. We're so glad that you enjoyed your holiday here in Rivel. It would be lovely to see you again sometime. Accommodation was very clean, tidy and homely. Everything you would need for a wonderful holiday. It made a great base to explore loads of sleepy villages and castles. Great garden, field and forest to explore. A large variety of birds around including some amazing Griffin Vultures flying above. Thanks again to our hosts Gill and Lionel for a really great week. See you again soon. Thank you for the kind review. It was a pleasure to have you here and to see you enjoy so much of what the area has to offer. You certainly made the most of your time here, but there is always more to do! We look forward to welcoming you here again at Quatre Bougies. As always it's a bit of a surprise whenever you arrive at a holiday house but this was everything we could have hoped for. Firstly, there is the pool (which i had forgotten about), then there are the hosts are a really, really approachable and helpful and also leave you to get on with your holiday. Then there is the perfect location; it's surrounded by nature, abundant with butterflies and birds and trees, it's really quiet, there is a place to park a car, and within walking distance there is a restaurant/bar which takes cards in case you do feel like going and getting a beer. Ten minutes drive from the gîte are shops selling all that you need. If you want a pad or a base in the south of France near an airport with shops and amenities but yet is quiet, secluded and fun.... this is the place to stay. I particularly recommend this gîte to families with young children. Thank you for the lovely, positive review. You may have forgotten about the pool since booking, but I'm sure Esme never will! She certainly enjoyed it. It is so good to see the pool and gardens being used and enjoyed. It would be a pleasure to welcome your lovely family back here one day. Nous avons passé un excellent séjour chez Gill et Lionel. Le gîte est confortable et idéal pour 2 ou 3. Les atouts : le calme, le cadre et la piscine qui semble être au milieu de nulle part. Les hôtes sont charmants, discrets et disponibles. Merci beaucoup pour votre belle critique. Sachant que nos invités ont été à l'aise dans le gîte et ont apprécié leur séjour, cela signifie beaucoup pour nous. Nous aimerions vous revoir ici peut-être? Full payment required if arrival date is within 40 days of booking.